Learning from texts is an essential skill for college success, and in an increasingly complex and interconnected world it is ever more important that students develop the intellectual and practical skills for lifelong learning. The aim of this project was to evaluate the impact of reading reflections on student reading, learning, and self-awareness as learners. Students submit reading reflections after completing each reading assignment. These reflections not only encourage students to read more regularly, they also promote content mastery and foster student development of monitoring, self-evaluation, and reflection skills. For the instructor, reading reflections can also be used to facilitate 'just-in-time' teaching. Our results thus far confirm that the introduction of reading reflections in our courses has resulted in significant improvements in student reading and course performance. At Macalester College, the project was conducted in two different sections of the Dynamic Earth and Global Change course (GEO-150) during Fall 2009. This is an introductory course that serves both majors and non-majors. One section of the course, the experimental section, was limited to first-year students and was capped at an enrollment of 17. The second section, the control group, enrolled 35 students ranging from first years to seniors. The courses were otherwise identical (e.g., same textbook, exams, classroom activities, projects). At Hamline University, reading reflections were introduced into one of two sections of the Microeconomics course (ECON-1210). Majors and non-majors who ranged from first years to seniors enrolled both sections. The experimental section (with reading reflections) enrolled 34 students, whereas the control section enrolled 27 students. These courses where otherwise nearly identical. There is an extensive body of research on reading and reading comprehension that tells us much about the reading process. There is little question that metacognitive skills (thinking about, and regulating, one's own thinking) play a critical role in learning from texts (e.g., Paris et al., 1996). Compared with novices, "expert" readers are skilled at using a wide range of strategies during all phases of reading (e.g., setting goals for learning, monitoring comprehension during reading, checking comprehension, and self-reflection). It is often assumed that students generally learn these skills prior to coming to college. Even when not assumed, it is rare for students to receive explicit instruction on reading in college. Reading reflections, first described to us by David Bressoud (2008), are designed to address some of the challenges students face with college-level reading assignments. Students submit online reading reflections (e.g., using Moodle or Blackboard) after completing each reading assignment and before coming to class. In each reflection, students summarize the important concepts of the reading and describe what was interesting, surprising, or confusing to them. The reading reflections not only encourage students to read regularly before class, they also promote content mastery and foster student development of monitoring, self-evaluation, and reflection skills. For the instructor, reading reflections facilitate 'just-in-time' teaching and provide invaluable insights into student thinking and learning. The work of this project has helped us be more explicit about reading in our courses. We now use reading reflections in all of our courses to encourage regular and frequent reading. I also have students complete reading strategy surveys, which are designed both to survey their reading habits, and to educate them about the strategies available before, during, and after reading. In our introductory courses, we also talk explicitly about reading strategies and we model the process of reading college level texts. As a result of the project, we have also become more metacognitive about our teaching, and we approach each of our courses more like a research problem. It has helped us be more explicit about cognitive and metacognitive skills in our instruction, and we feel more confident in adding reflective activities to our courses. We are also more likely to seek evidence of improved learning after making pedagogical changes. As with most aspects of student learning, the story is complex. There is no question that reading reflections have a significant positive impact on student reading. 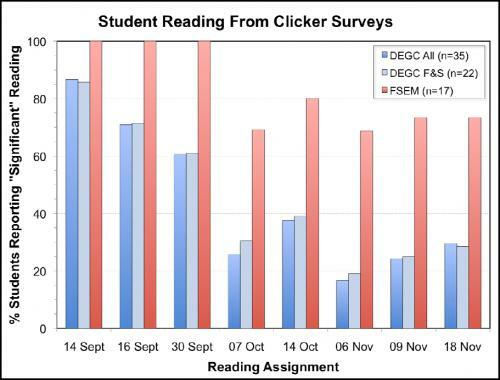 In courses with reading reflections, students report more regular (Figure 1) and deeper reading before coming to class. Students in reading reflection courses also report using a greater number of strategies during the pre-reading, reading, and post-reading phases. 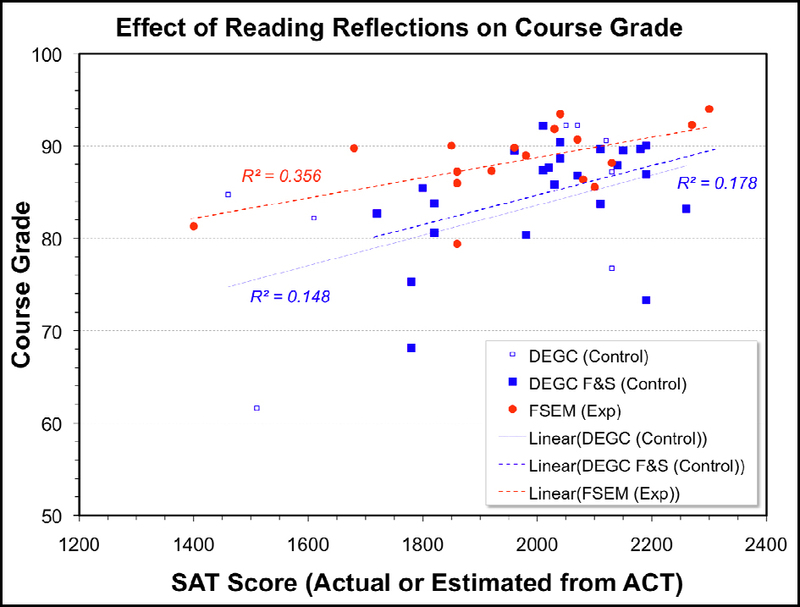 On average, students in Macalester courses with reading reflections earn higher overall grades than students in courses without reading reflections, and this trend holds across SAT scores (Figure 2). Analysis of course grade data suggests that improved preparation to participate in, and learn from, classroom activities is the likely cause of the improved course grades. 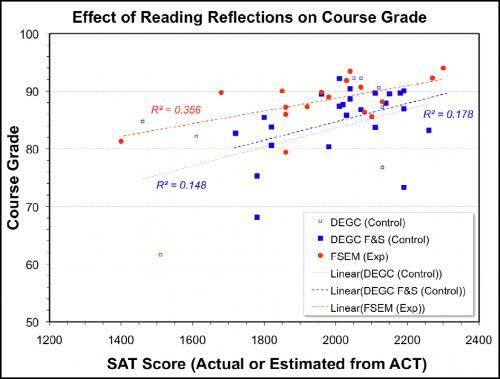 Data from the two sections of Microeconomics at Hamline University yield similar results, but also tell a slightly different story; reading reflections there also have a powerful positive effect on content learning (exam scores), and there is evidence that this effect may be more significant for underprepared students. Analysis of student response data from the MSLQ (Motivated Strategies for Learning Questionnaire) suggest that reading reflections have little impact on student motivation, affect, or cognitive/metacognitive skills, but students in the intervention group reported decreased test-anxiety and slightly increased help-seeking in post-course surveys compared with those in the control group. There is no longer any question in our minds that reading reflections are a powerful intervention for improving learning. With reading reflections, students read more regularly before coming to class, they read more deeply, and they use a wider range of reading strategies. They are better prepared to participate in, and learn from, classroom activities resulting in deeper content learning. There is also evidence that this intervention might hold even greater potential for under-performing students. 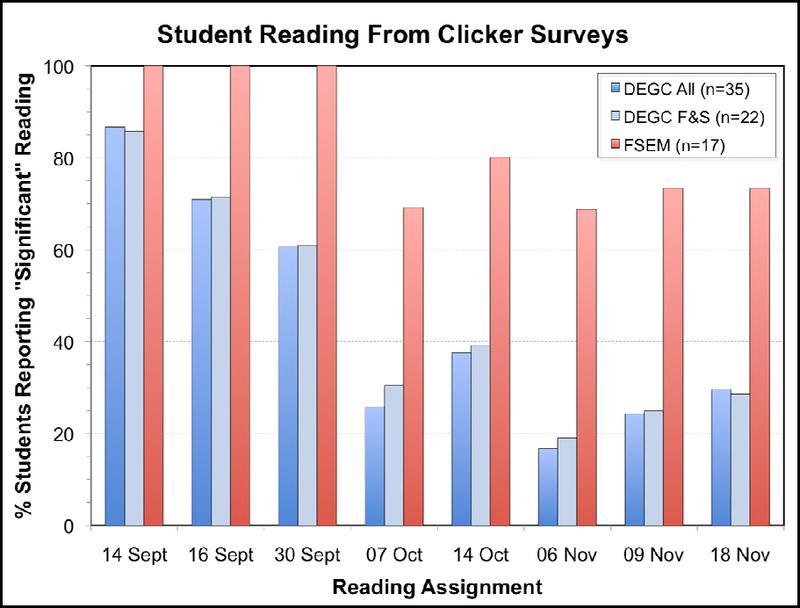 The significant positive results of this activity indicate that reading reflections are an effective way of improving student learning. We will continue to utilize reading reflections in all our courses. We are still trying to figure out the best approach to providing instruction to students on reading. At present, some students interpret this instruction as remedial, and so are less than enthusiastic learners when it comes to improving reading skills and knowledge. We are also interested to know if varying the questions on the reading reflection (making them more topical and specific) might result in even greater learning gains. Finally, textbooks and college reading seems to be in somewhat of a state of flux (rentals, PDF's, ebooks) right now, so it is difficult to know how reading strategies might need to be adapted as more classrooms move to electronic texts. Barr, R., Kamil, J.L., and Rosenthal, P. (editors), Handbook of Reading Research, Longman Press, NY. Bransford, J.D., Brown, A.L., and Cocking, A.R. (editors), 2000, How People Learn: Brain, Mind, Experience, and School: National Research Council, National Academy Press, Washington D.C., 346 p.
Dunlosky, J., and Metcalfe, J., 2009, Metacognition: Sage Publications, Thousand Oaks, CA, 334 p.
Ertmer, P.A., and Newby, T.J., 1996, The expert learner: Strategic, self-regulated, and reflective: Instructional Science, v. 24, p. 1-24. Gourgey, A.F., 1999, Teaching reading from a metacognitive perspective: Theory and classroom experiences: Journal of College Reading and Learning, v. 30, p. 85-93. Higdon, J., and Topaz, C., 2009, Blogs and wikis as instructional tools: A social software adaptation of just-in-time teaching, College Teaching, v. 59, p. 105-109. Isaacson, R.M., and Fujita, F., 2006, Metacognitive knowledge monitoring and selfregulated learning: Academic success and reflections on learning: Journal of the Scholarship of Teaching and Learning, v. 6, p., 39-55. Lorch, Jr., R.F., Lorch, P.E., and Klusewitz, M.A., 1993, College students' conditional knowledge about reading: Journal of Educational Psychology, v. 85, p. 239-252. Mokhtari, K., and Reichard, C.A., 2002, Assessing students' metacognitive awareness of reading strategies: Journal of Educational Psychology, v. 94, p. 249-259. Paris, S.G., Wasik, B.A., and Turner, J.C., 1996, The development of strategic readers: in Barr, R., Kamil, M.L., Mosenthal, P., and Pearson, P.D. (editors), Handbook of Reading Research, Vol. 2, Erlbaum Associates, p. 609-640. Pintrich, P.R., 2002, The role of metacognitive knowledge in learning, teaching, and assessing: Theory Into Practice, v. 41, p. 219-225. Rawson, K.A., and Dunlosky, J., 2007, Improving students' self-evaluation of learning for key concepts in textbook materials: European Journal of Cognitive Psychology, v. 19, no. 4/5, p. 559-579. Taraban, R., Rynearson, K., and Kerr, M., 2000, College students' academic performance and self-reports of comprehension strategy use: Reading Psychology, v. 21, p. 283-3008. Taylor, S., 1999, Better learning through better thinking: Developing students' metacognitive abilities: Journal of College Reading and Learning, v. 30, p. 34-45. Thiede, K.W., and Anderson, M.C.M., 2003, Summarizing can improve metacomprehension accuracy: Contemporary Educational Psychology, v. 28, p. 129-160. Zimmerman, B., 2002, Becoming a self-regulated learner: An Overview: Theory into Practice, v. 41, no. 2, p. 64-70.